Lucy and Lexy are two ladies that love cooking almost as much as we love each other. We've decided that we want to share our experiences and tasty treats with everyone! 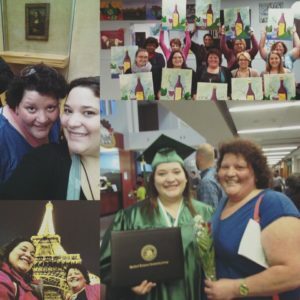 Between this mom and daughter duo they have visited countries all over Europe and are excited to share their joy and some of their culture with everyone! We at The Cozy Cannoli value relationships and our goal is for each and every person walking through the door to enter as a friend and leave as part of our family. This mother-daughter team are some passionate ladies! Hi, I am first generation Italian-American, the youngest of four. I have a passion for cooking and I love a good twist on a classic recipe. Growing up in a very Italian home I learned important values from my mother that I am passing on to my daughter , and now, all of you! I love making people smile with my cooking so get ready! Hello! I am a Culinary Arts graduate of Weaver Academy and Guildford Technical Community College. A few years ago I had the opportunity to live, intern, travel, and learn in Florence, Italy. I have also backpacked and traveled to over 20 countries in Europe and Africa. I cannot wait to share my experiences with you!